Hey guys, I just purchased my first acura. Been a Honda guy since I started driving. I know, same difference. Anyway, shocks are shot in this car and I need advice on what shocks to go with. I already have a set of H&R Sport Shocks. 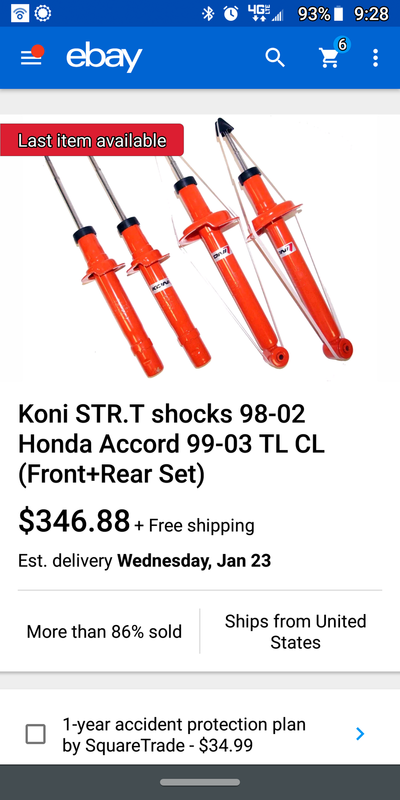 I'd like to get the Koni Orange shocks. I found some on ebay, but everywhere I look, including the actual koni site, says they don't make them for my 1999. Anybody have good suggestions for a set of shocks? WTB: /RSB/Spacers/Spoiler/IN NEED OF TOKICO SHOCKS OR KONI SHOCKS ASAP! longevity of stock shocks and best aftermarket shocks?